Oh My Got is a high-end brand of unique diamond cufflinks for gentlemen who appreciate luxury and style, and expect nothing less than the best quality. 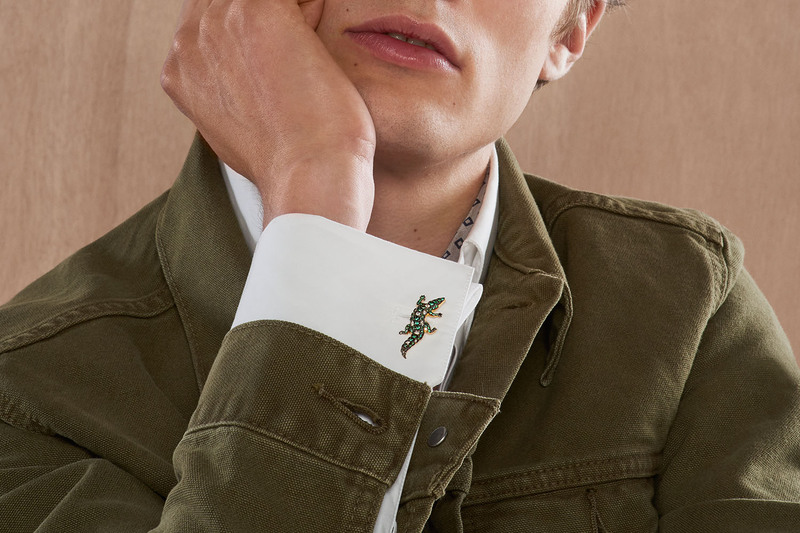 Last year, we launched our first cufflink designs, and they clearly hit the mark. We’re glad our exclusive designs were so well received and we want to thank everyone for their kind words and positive feedback. We sincerely hope you’re enjoying our skillfully handcrafted cufflinks. Wear them proudly! Thanks to your enthusiasm, our design workshop hums with a sense of excitement. David Gotlib – founder of Oh My Got Cufflinks – and his design team are continuously exploring new inspirations and striving for original cufflink designs. And today, we proudly extend our existing Classic, Smart and Dare collections with 14 new cufflink designs, mainly inspired by geometry, history and nature. Please have a look at our new designs below. We are very curious to know what you think! Do you like abstract cufflink designs? Wear Partnered Triangle. Pure diamond studded geometry! ‘Partnered Triangle’ is a sleek 18k pink golden pair of cufflinks, containing 98 natural diamonds. Nothing beats classic elegance, right? ‘Victoriana’ combines the refined spirit of Victorian design with state-of-the-art craftsmanship. ‘Victoriana’ is an 18k white gold pair of cufflinks, containing 8 diamonds, 48 sapphires and 2 agates. ‘Madison’ exudes exquisite elegance and class for every occasion. Wear them proudly. These ravishing 18k yellow golden cufflinks are crafted with 424 natural diamonds. Inspired by the Far East’s rich past, ‘Emperor’ resembles an imperial diamond artefact. Mysterious. Timeless. Elegant. ‘Emperor’ is a regal 18k white & yellow golden pair of cufflinks, containing 214 diamonds and 2 smokey quartz. ‘Rock of Gibraltar’ impresses with a beautiful range of earthy tones. Wear them to rock the magic of gems! 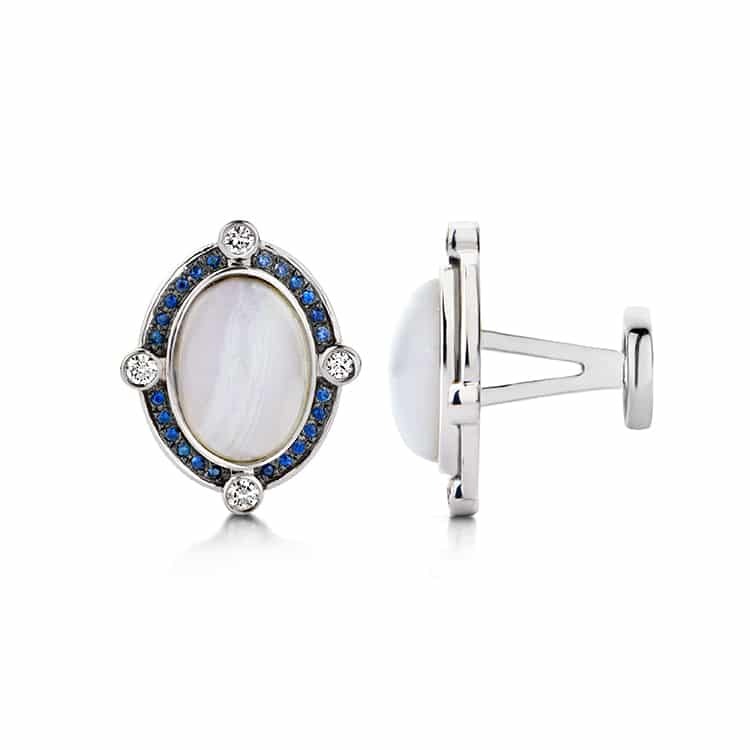 These elegant 18k white gold cufflinks are crafted with 214 diamonds and 2 moonstones. No matter how busy or stressful your day is, these soothingly beautiful cufflinks will keep you in touch with nature’s serenity at all times. A ‘Soothing Gem’, right up your sleeve! ‘Soothing Gem’ is an enticing 18k yellow golden pair of cufflinks, containing 66 diamonds and 250 emeralds. ‘Las Vegas’ is Oh My Got’s lucky strike cuff, edging the odds with fine diamonds and gold. These classy 18k pink and white golden pair of cufflinks are crafted with 176 diamonds and 120 rubies. ‘Crocodile Dandy’ reflects power, agility and flexibility. Think like a predator and sink your teeth into success! 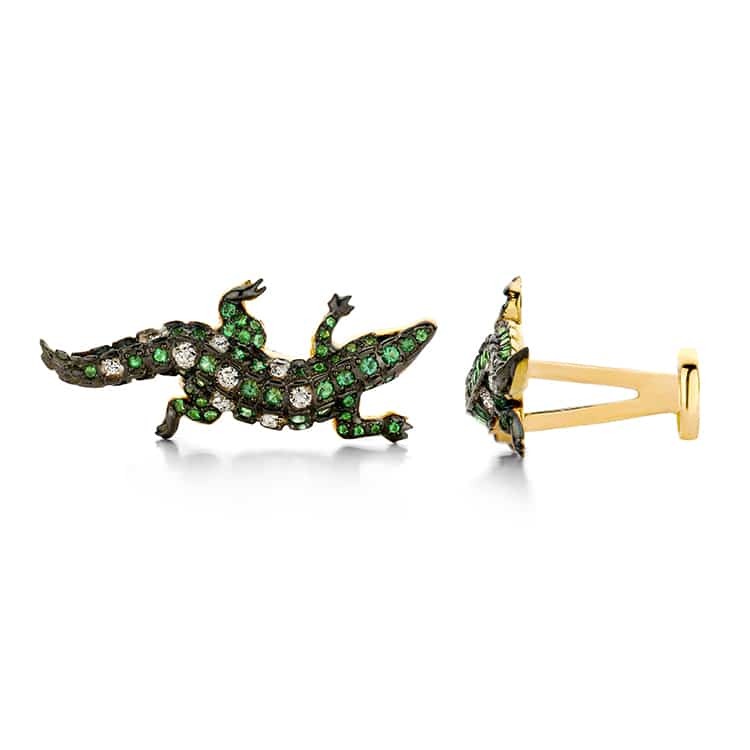 These dandy 18k gold cufflinks are crafted with 18 diamonds and 100 emeralds. Jump-start your morning by putting on these lively cufflinks and leap at the opportunity to seize the day! ‘Jump Start’ is a playful 18k yellow golden pair of cufflinks, containing 12 diamonds and 200 emeralds. Do you want to add a dash of dark, mysterious charm to your evening wear? Wear Acrobat to roam the night in style. Only for gents with a sonic lifestyle! ‘Acrobat’ is a bold 18k white golden pair of cufflinks, containing 380 diamonds. Dive in style to success and diamond elegance, poised by the power and grace of the sea! ‘Pacific Sea Star’ is a wonderful 18k yellow golden pair of cufflinks, containing 74 diamonds, 140 emeralds, 190 sapphires and 2 pearls. Wear ‘Blue Bird’ to elevate your style game and make a great first impression. After all, fine feathers make fine birds! 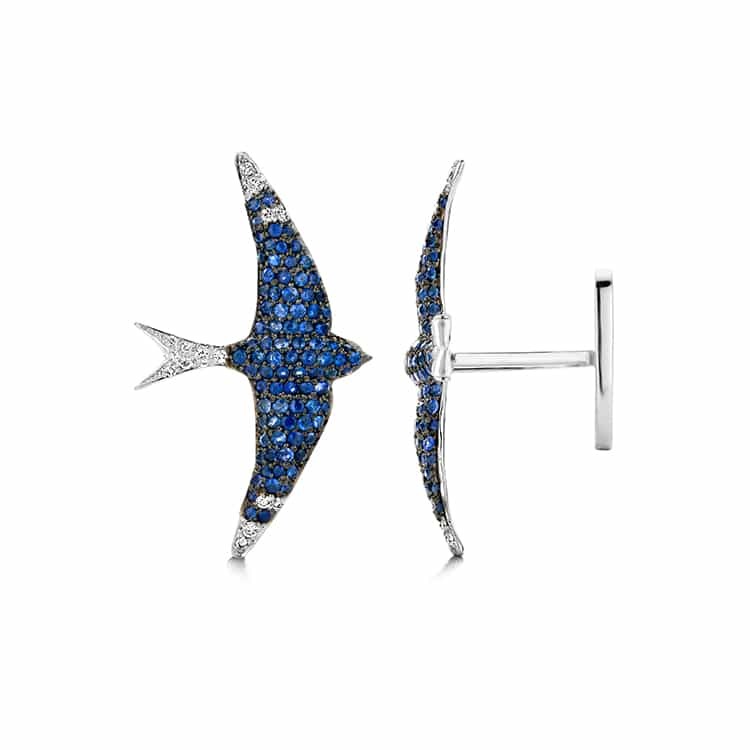 ‘Blue Bird’ is a stunning 18k white golden pair of cufflinks, containing 26 diamonds and 164 sapphires. These stunning lady birds are a real collector’s catch. Nature’s beauty and the fire of gems work their magic in intense, intricate, symmetrical style. ‘Lady Bird’ is a lovely 18k yellow pair of cufflinks, containing 190 diamonds and 70 rubies. With these beautiful bird cufflinks as a finishing touch, you’ll be in full feather. Time to fly high! ‘High Flyer’ is a beautiful, handcrafted white golden pair of cufflinks, containing 170 diamonds. Did you like these new exclusive cufflink designs? Great! Be sure to explore our collections to have a closer look. You won’t regret it!